The task and banking system at Bronx Arena is a way for the school to provide structure and accountability within a very open environment. Since Bronx Arena students are likely to join the school either overage or under-credited (or both), there is an emphasis to help them complete their coursework in under four years. To help keep students on track, Bronx Arena sets a goal for students to complete five learning tasks each day. Every day, each student has five tasks to achieve to be successful. Students understand that not all tasks are equal and some may take more or less time than others. Students can “bank” tasks when they complete more than five in a day, giving them some leeway when future tasks may make it hard to hit their daily goal of five (e.g. essay writing). Students who complete less than five tasks a day can go into the negative, and when certain thresholds are hit (e.g. -10), educators check in and possibly provide interventions to the student. The banking system helps students self-manage their productivity, helps teachers monitor it, and provides quality data for conversations when interventions might be necessary. Each student identifies a minimum of five tasks they will achieve by the end of the day. Usually one for the Learning Lab and one per hour of Arena time. This can be modified for students struggling in certain areas or for IEP’s etc. If a student needs more time to finish five tasks, they can extend their learning outside of school hours, using their own devices or one provided by Bronx Arena. The bank can be in the positive or negative depending on extra tasks students have completed or tasks not completed by the end of the day. Each task students achieve over the five tasks in a day threshold adds one point in the bank per task. If students achieve less than five tasks in a day, a point is subtracted from the bank per task (e.g. if a student completed three tasks in a day, that would subtract two from their bank). Students who have a positive bank can “withdraw” when completing less than five tasks in a day, taking points away from their positive bank when necessary. Students with a negative or neutral bank go into the negative (or further into the negative) when completing less than five tasks in a day. -5: Teacher and Counselor meet with student. -20: Arena team (similar to grade level team) meeting in order to form an academic plan and identify the issue at hand. Parents are also brought in depending on the situation. +10: Positive phone call home. +20: Certificate (at three certificates, students receive a gift card or swag). 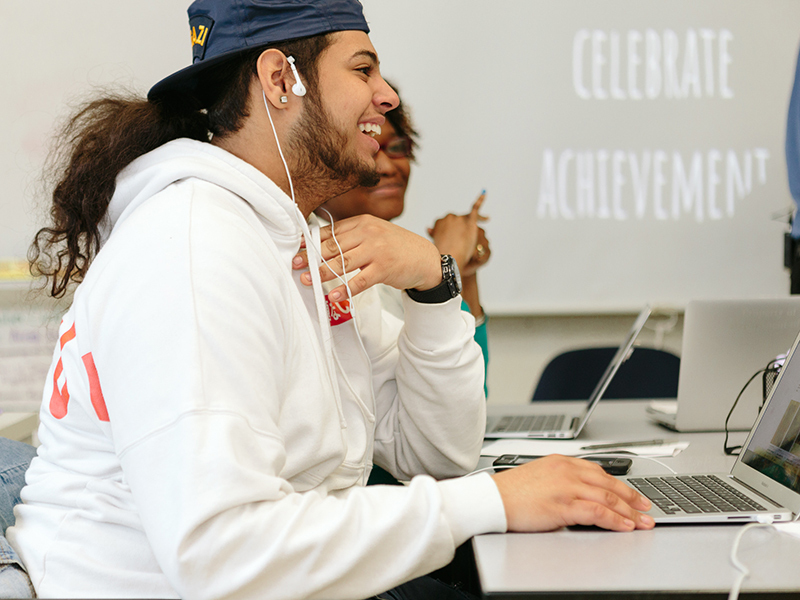 Bronx Arena believes it is just as important to celebrate the wins as identify areas of concern so that all students are brought into the structure and are pushing themselves to their own highest expectations. Identifies five daily tasks and builds out a plan to achieve them (e.g. one per hour). Monitors own progress toward daily goals. Tracks their bank points to allocate them to other tasks when needed. Identifies interventions needed when a student is in the negative. Rewards students when they are in the positive. Utilizes the bank to monitor student progress. Gives additional support to students when needed to reach their daily, weekly, monthly, and long term goals. Tracks points and tasks completed and planned for each student.